The Round Tuit – Overcoming Procrastination..
Procrastination (from the Latin) is the tendency to put off today what can wait until tomorrow, to delay an undertaking, to find an excuse not to do something. It can be a paralysing and costly tendency, if for example you put off paying the parking ticket and are fined. But what’s behind procrastination? Some people have a habitual tendency to out things off until the last minute, perhaps because they hope the task may become redundant. They may just dislike the task, such as cleaning the guttering. They may be putting off something they feel they ought to do rather than want to do, like visiting the in-laws. There may genuinely be no urgency and it’s just easier to leave something difficult, disagreeable or unpleasant for as long as possible. Sometimes it is the sheer size of the task that puts people off starting. Procrastinators may fear the consequences of doing the thing they are putting off, either fear of failure, or fear of success, e.g. applying for that new job. Is the ‘round tuit’ a cure? Probably not, magic bullets are rare, so what is? When I’m coaching I like to see if the coachee can identify why they are putting off the task. How likely is it to go away? It may be that the most useful thing is to identify the fears. What is the worst that can happen if you do it, what’s the worst that can happen if you don’t do it? What is there to be really afraid of? How could you make it safer to do this? Procrastination is a key tool of our ‘safekeeping self’ as it maintains the status quo, so what are you getting out of not doing the task? What would be the consequences of never doing it? What are the benefits of doing it? If it’s an unpleasant and disagreeable thing, will it grow any less so when it is accompanied by the guilt caused by delays? Is the short term pleasure of doing something else really going to outweigh the satisfaction of accomplishing what you’re avoiding? Research shows that if you start a task then you are more likely to complete it.. the brain can forget things not started but creates an anxiety about a half done task. So work on the activity ‘for just a few minutes’, then the anxious brain will not rest until it is done. How do you eat an elephant? In small chunks! Sometimes making a plan about how to accomplish the task can helps; a technique known as salami slicing. By identifying small specific steps the enormous project can seem much less daunting.. sometimes we even wonder why we were worried! 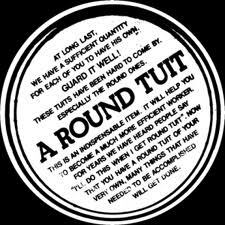 Did my Father need a ‘round tuit’? Not really, he was always clear about what he wanted to do. He’d worked out that if he kept putting it off, he probably didn’t really want to do it all and so he just crossed it off the To Do List!